The Mazda Miata has one more year before a big makeover for 2016, but Mazda is sending the NC out in style with the limited-production 25th Anniversary Edition, which it showed for the first time last month at the New York Auto Show. Only 100 of the 2015 Mazda Miata 25th Anniversary Edition models will be sold in the U.S., and Mazda has designed an elaborate registration process to help ensure everyone has a fair shot of adding this rare Miata to their collection. Registration for the car opens on May 20, 2014 at 10:25 am PDT, and it will remain open through May 31 or until 250 pre-orders have been received, for a maximum of 11 days. 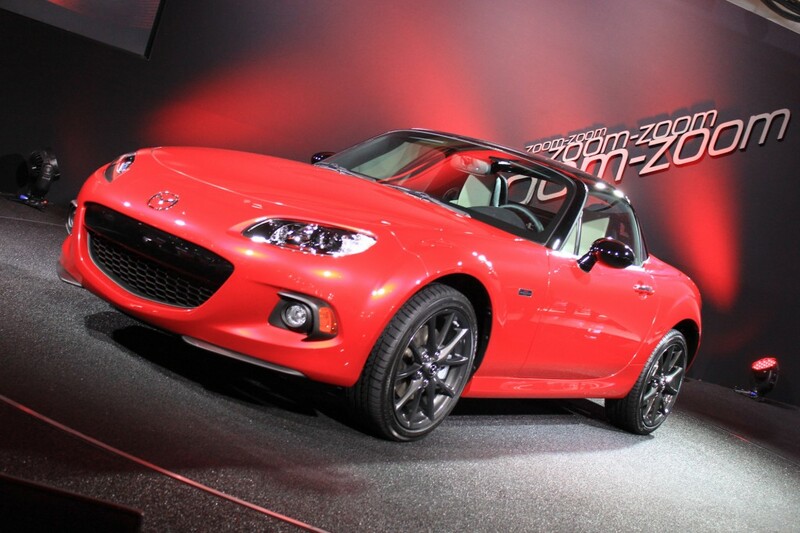 Of these 250 pre-orders, Mazda will then directly contact the first 100 to confirm they intend to purchase the Miata. Anyone who submits multiple registrations will be disqualified. During the pre-order process, customers will choose their only two options for this car: transmission (six-speed automatic or manual) and their desired dealership. All 100 of these anniversary models will come with the power retractable hard top and painted in Soul Red Metallic with black accents on the roof, windshield surround, door mirrors and fog light bezels as well as gunmetal 17-inch wheels. Inside, these Miatas will get Almond leather seats with the 25th Anniversary Edition badge etched into the headrests and stainless steel door sills. All of this exclusivity and bonus content comes at a cost, as the 2015 Mazda Miata 25th Anniversary Edition is priced starting at $32,205 – close to $10,000 more than a base 2015 Miata. Built into this price though is the Tourneau watch and winder box that all owners will get as a special gift commemorating the car. The watch will feature a black leather strap with red accents and the MX-5 logo.